Grill A Chef: What the heck do I do with a Brussels sprout? Don't over cook them! That's the first rule. When Brussels sprouts, or certain members of the Brassicaceae family (cabbage, broccoli, kale) are cooked too long they take on a sulphuric taste and smell. Their bright green color turns brown and the otherwise snappy texture becomes soft and mushy. This is how so many people have come to know them (my mom certainly cooked the heck out of them) and Brussels sprouts, as a result, are a target of mass dislike. Our advice is to choose just one cooking method. Either steam OR roast OR boil OR saute. We've learned that folks think sprouts need to be boiled first, then sauted and we say no, no no. There is no need for a two step process. It's much easier that that. In deciding your technique Josh explains that with steaming or boiling, you are essentially adding water to your sprouts. Water is flavorless and therefore dilutes the flavor or the vegetable. If you choose to roast or saute, the water is being cooked out. This helps to concentrate the natural flavors and makes your food tastier. Logic in the kitchen! Here is a recipe for exactly that. It's a high heat roast in which you place your sheet pan or baking dish in the oven first, and then you add your prepared veggies to the hot pan and continue to roast. This helps speed up the crispy caramelization on the outside of the Brussels sprouts while the inside cooks through, but not too much. Try this method with any of your favorites...carrots, cauliflower, onions, parsnips, broccoli, etc. • Place a metal sheet pan in the oven and heat it to 450 degrees. 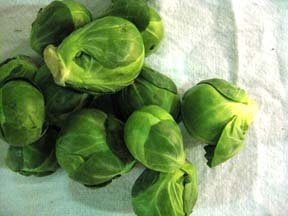 • To prep your sprouts: nip off the stem end, remove any nasty looking leaves and cut them in half. • Toss the halves in oil with salt and pepper. • Dump the Brussels sprouts onto the sheet pan and spread them out evenly. • Roast for 12 minutes giving them a good stir half way through. Once roasted, they are delicious as is but you can add all sorts of things to them to make them even better. Toss them with roasted nuts, crumbled bacon, blue cheese, goat cheese...the list goes on. We will turn you all into Brussels sprout lovers yet!